If you have diabetes, here are some super easy ideas to reduce the carbs in your diet. 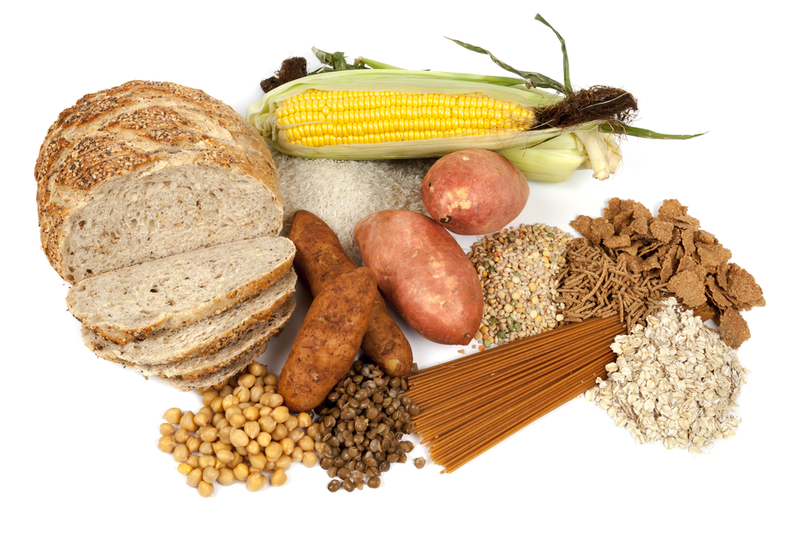 Did you know that there are some cool, nifty ways that you can reduce carbs in your diet? You can still enjoy maximum flavour but reduce the carbohydrate content of some of your favourite foods, even your favourite comfort food! Reducing the carbohydrate content of some of the foods that you eat, can impact on your blood glucose levels (sometimes called blood sugar levels). For people with diabetes, it is important to be mindful of the amount of carbohydrate food that you are eating every day. Being aware of your carbohydrate intake, can ensure that you are managing the condition well. There are so many simple ways that you can change the amount of carbs that you eat, while still enjoying your favourite foods, even your favourite comfort food! Have a look at our carb alternatives. Potato, whether regular white potatoes or sweet potatoes, is such a staple food in everyone diet. Potato, especially white potatoes, are a high carbohydrate food. You don’t have to completing cut potatoes out of your diet! You can still enjoy them at dinner. By making some simple changes to the way you prepare and eat your potatoes, can help to reduce the amount of carbohydrates you consume. Below are two great examples for mashed potato and baked potato. When making mashed potato, try combining a ratio of half mashed cauliflower with half mashed potato. Did you know that 1 cup of potato/cauliflower mix is equal to 17g of carbohydrate? Compare this to 1 cup mashed potato, which equals 30g of carbohydrate. This means, that 1 cup of mashed potato on its own, is equal to two portions of carbohydrate. After chopping up the cauliflower and potato, boil them together in the same pot. Once cooked, mash them! Cauliflower boils well and is easy to mash. It is also a relatively flavourless, so if you enjoy the flavour of potato, cauliflower won’t have much of an impact on the taste! By including a range of vegetables at dinner time, not only can it help to reduce the carbohydrate content of your meal, it will also mean you’re getting a wider range of nutrients in your diet. Potato skins are such a fun snack to make. It’s like making a pizza, but with potato skins as the base instead! It’s also a great way to get the family involved in cooking, kids included, and everyone can have their own favourite toppings of choice. 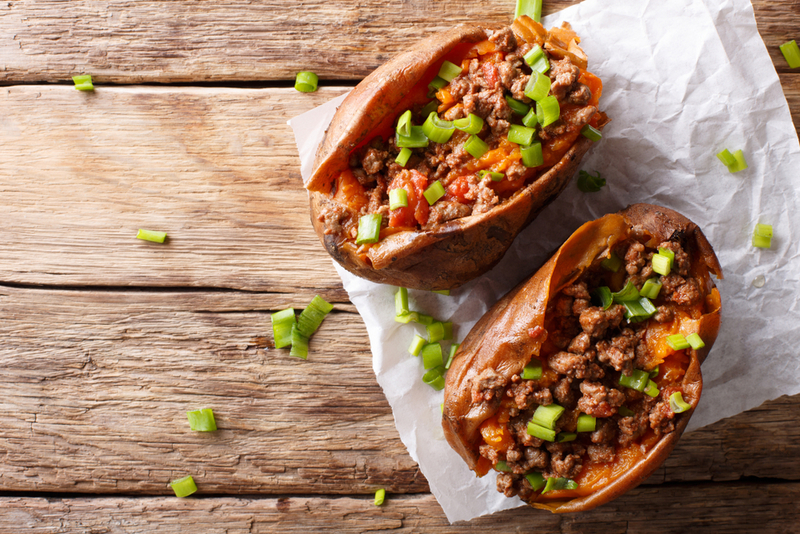 A 210g baked potato will have 30g of carbohydrates or two portions. This same potato made into potato skins has around 11-15g CHO and are likely to fill you up more when filled with protein foods such as chicken, lean beef, and pork. Everyone loves fried rice! And mixing in cooked veggies with rice, is so simple! When making rice and mixed veggies, measure an equal amount of rice to veggies, for example ½ cup of cooked rice and ½ cup of mixed veg. A single cup of plain white rice contains 60g of carbohydrate. That’s 4 portions of carbohydrate! Replace this with a ½ cup of rice, and a ¼ cup of capsicum and ¼ cup peas to provide 32g of carbohydrate or two portions. You can either cook these vegetables separately and mix it in with cooked rice or add to a non-stick frying pan with the rice to make a vegetable loaded fried rice! Chopping the veggies into small pieces, can help keep the texture/mouth feel of rice in your meal. It is easiest to make cauliflower rice with a food processor. Cut up the cauliflower into small chucks, then blitzed it in the food processor until they are the same size as rice grains. To cook, use a small amount of extra virgin olive oil in a frying pan, and cook like you would fried rice. 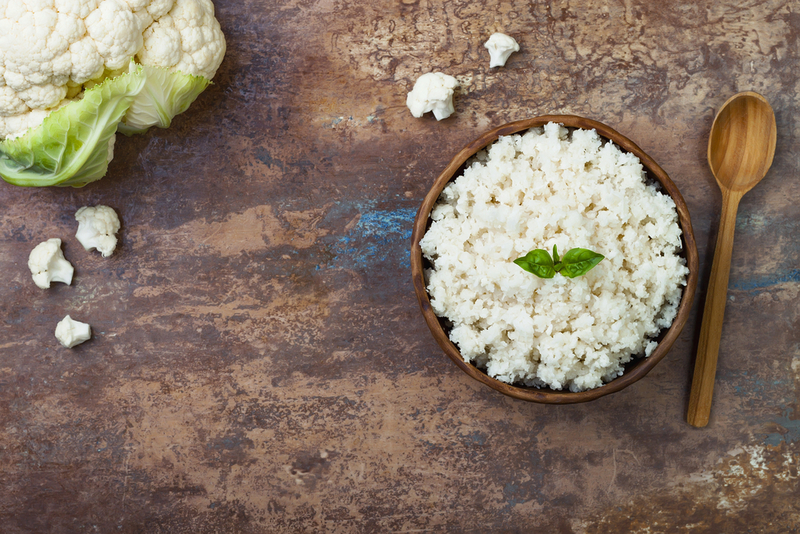 A cup of cauliflower rice has 5g of carbohydrate, compared with 1 cup of plain white rice equally 60g of carbohydrate. You can use this technique with broccoli too! Why not try a combination with rice, or on its own as a replacement? You can buy cauliflower prepared as ‘rice’ from supermarkets also. Who doesn’t love pasta dishes! Bulk up your pasta or noodles by adding toppings and sauces that contain lean protein and vegetables, such as basil pesto with chicken breast, tomatoes, and broccoli. A bowl of pesto pasta (1.5 cups pasta and a ¼ jar of pesto) contains 67g of carbohydrate. Swap this for 3/4 cup pasta, with 110g skinless chicken breast (about 1/3 breast), 100g broccoli (about 5 florets), 1 chopped tomato (about 160g), and ¼ jar basil pesto contains 39g of carbohydrate. Adding in protein to your meals, like chicken, can keep you feeling fuller for longer, and in combination with some vegetables, creates a much more wholesome meal. Spaghetti squash is like the pasta of the vegetable work! It’s important to note, that the fibres of a spaghetti squash grow around the centre of the vegetable, similar to the rings of a tree trunk. So, when cutting, cut middle across the squash rather than lengthways as this will provide longer ‘spaghetti’ strands. Whenever you’re cutting pumpkin, always be careful when using a sharp knife! One cup of spaghetti squash contains 10g of carbohydrate compared to 43g in a cup of plain pasta. Sprinkle a salt on each half and sit for at least 20mins to draw out excess liquid. This helps the spaghetti holds its shape. 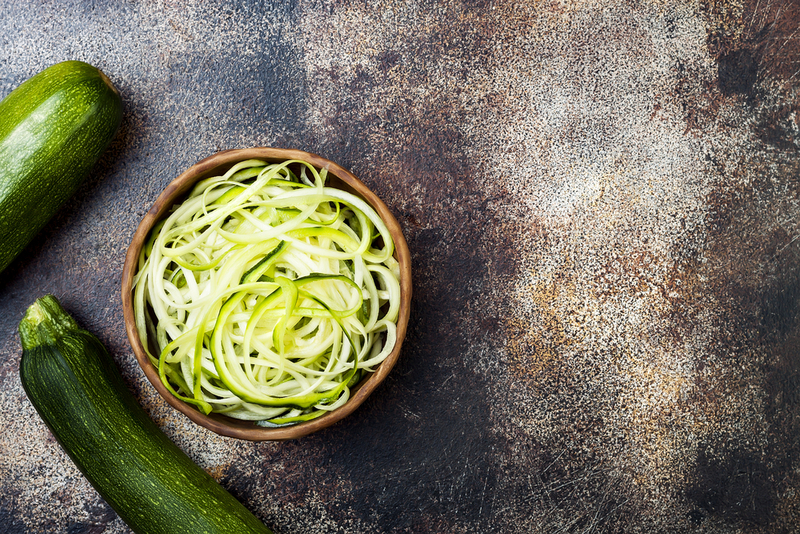 Zoodles are zucchini’s which have been sliced or spiralled to resemble spaghetti. Many supermarkets are now selling zucchinis prepared this way. To avoid watery zoodles, once shredded, place them on some paper towels for a few hours or place in a drainer with a sprinkling of salt over them. This will draw out excess liquid from the zucchini. 250g of zoodles will provide 4g CHO. Cook using dry heat i.e. frying pan. Add a sauce that includes a lean protein such as bolognaise made with lean mince to help keep you full. This technique can be used with pumpkin and carrots too. Available in supermarkets are pasta substitutes made from Konjac flour (a plant well known in Asian countries). These noodles are low in carbohydrate. For example, 100g of pasta made from Konjac flour has 10g of carbohydrate, compared to 100g of wheat pasta containing 28g CHO. Halve the amount of carbohydrate of your sandwiches by having an open sandwich. An open sandwich is one slice of bread with toppings on top, instead of a sandwich which is two slices of bread with toppings in between. This works nicely by swapping a toastie (2 slices bread) for an open sandwich. A simple open sandwich includes ham, cheese, and tomato and cooked under the grill. Make the open grill more filling by putting more toppings on, including more of your favourite veg like capsicum or baked beans. or explore our 12 week diabetes program. 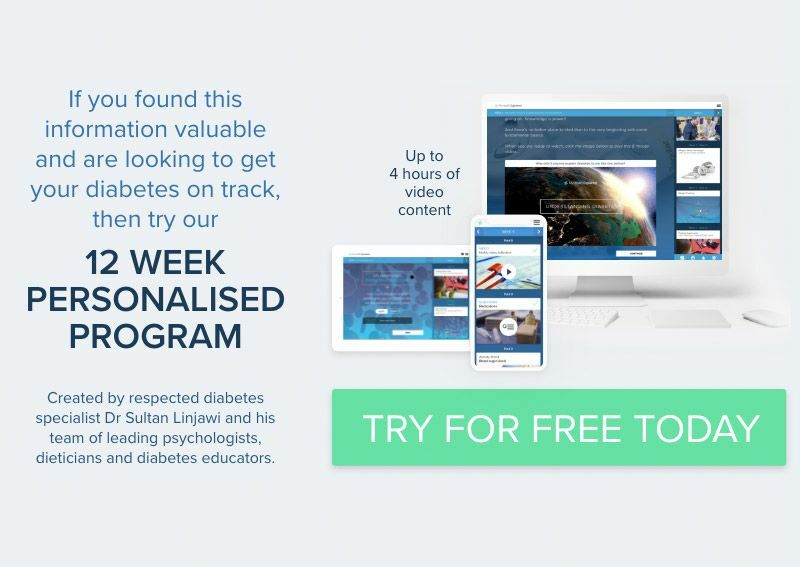 The program is personalised, giving you more of the content that you want to see. When you sign up, you receive the first week free! Interested in more videos and articles about food and diabetes? Here’s a selection of more articles you may be interested in.